The Uruan civilisation arose in late Pleistocene times, when it was still possible to walk between Australia and New Guinea; and Australia was part of a great land-shelf stretching to mainland Asia [see Chapter One]. Native traditions recall a similar ‘shelf’ extended from New Guinea southward to New Zealand, and westward to Tahiti; the “Lost Land of Wainga-roa” of the Maoris; which Polynesian tradition says was inhabited by a race of fair-skinned builders in stone. Everyone has heard of fabled Atlantis, yet how many people have heard of the submerged megalithic culture centres in Torres Strait? Or the sunken pyramids claimed to lie off Daru, Bristow and York Islands, and native tales of the “lost race of the Solomon Sea” [called ‘Uru’ by some tribes?]. all. Nim the Sun, He resides in His Temple”. Photo © Rex Gilroy 2004. These traditions, together with a trail of mystery relics, rock inscriptions and megalithic ruins, stretching from Papua New Guinea and New Zealand across the Pacific to the Americas in one direction, and up through island south-east Asia to the Euro-Asian continent in the other, demonstrate the extent of the spread of the Uruan culture at the dawn of history. As argued in Chapter One, Homo erectus entered Australia to evolve into the earliest modern humans, who were well established here by around 300,000 years ago, and it is possible that by this time bands of these earliest Homo sapiens had begun spreading northwards, eventually to enter the Old World, and eastwards into the West Pacific landmass of Wainga-roa, New Zealand and eventually on to the Americas. 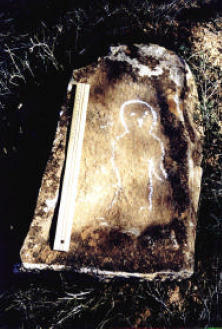 At which time the remaining earliest modern humans had begun to develop their unique megalithic culture in ice-age Australia is yet to be decided, although certain crude megalithic stone alignments found by the author in central western NSW date around 50,000 years BP, and are therefore the earliest astronomical structures erected on earth. The relative dates given for the erection of the megalithic monuments of Southeastern and mainland Asia-Europe [as described in Chapter Two], beginning with England’s Stonehenge and France’s Carnac [3000 BC], those of eastern Europe [4500 BC], mainland and Southeast Asia [between 5000 and 8000 BC] and New Guinea/island Melanesia [by 13,000 BC], clearly demonstrate that the first civilisation arose in Australia. 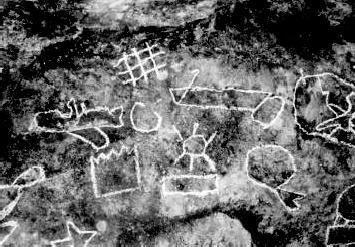 The name ‘Uru’ appears throughout the ancient world wherever the megaliths were erected. In New Zealand the early Maori believed the white-skinned Patupaiareh sailed there from the “land of Uru” to the west. The name Uru is commonplace in Maori culture. The early Polynesians called themselves ‘Urukehu’, meaning “descendants of the first chiefs”, who came from a land that lay to the west of New Zealand. ‘Uru’ meant ‘west’ to the Maoris. They called the Otago coast ‘Araiteuru’. ‘Uluru’ [Ayers Rock] in Central Australia, known to the Maoris as a passed down tradition of their earlier Polynesian forefathers, was also called Maunganui, as in Mt Maunganui at Tauranga, North Island! They call an area near Lake Taupo Putauru and once manufactured ancestor masks called Kouru, which represented important ancestors who came from the land of Uru. Travelling north from New Zealand, further ‘Uru’ language traits are to be found among the native peoples of Fiji and Tonga, the Gilberts and all the islands up to the Solomons, New Caledonia and New Guinea; further evidence to show Uruan culture spread deep into Oceanea. Polynesian tradition speaks of a highly advanced white-skinned race of people called the ‘Uru’, who entered the Central Pacific Islands in large watercraft, and sailed on to Peru. They came, say these traditions, from “a great land of the Sun”, located in the west where Australia is situated. This “land of the Sun” was called ‘Uru’ by the Peruvians and Mayans. The Peruvian legend of Manco Capac, founder of the Inca Empire, states that he was born on an island called ‘Guaya’ off the coast of Ecuador, and that his parents had been shipwrecked there, having sailed from a land “where the sun sets”. To this day, tribes of Indians inhabiting the shores of Lake Titicaca, on the Andean Altiplano, called the ‘Uru’, claim they are descendants from the race of White Gods who arrived in Peru from across the [Pacific] Ocean long ago, and who were also called ‘Uru’. Coupled with these traditions are other cultural remains. For, stretching from Lake Titicaca to Easter Island, and on through the Central Pacific Islands to New Zealand, and other West Pacific Islands back to Australia, there exists a trail of earthen and stone stepped pyramids and ziggurat-type structures, megalithic alignments, stone tombs, idols and other artwork, all of which find their earliest examples in Australia. The Sun-Worship Serpent and Eagle altars of Australia [ie Nim and I-na] parallel others in Melanesia also associated with Sun-Worship. In all ancient Sun-Worship religions the Eagle was the messenger of the Sun God, and so it was also with the Uruans. The Serpent and Eagle Sun-Worship symbolism is found across New Guinea in one form or another. In Papua New Guinea a giant-size stone altar carved in the form of a snake is reminiscent of others in the Shouten Islands, Biem area, where the natives worship a Sun-God in the form of a snake called by them ‘Uruan’. Several small crude stone idols recovered by me from the New England area, NSW megalithic circles resemble others once carved by the ancient Maoris, called by them Taumatua atua, and which depict ancestors of high repute, even deities. Similar examples are to be found across the Pacific Islands to Peru. Much larger carved male and female stone heads, depicting the Earth-Mother and Sky-Father, and others perhaps representing important ancestors, found in central western and northern NSW, find their counterparts in Papua New Guinea and its Melanesian island neighbours, as well as upon lonely Central Pacific Islands. To the Peruvians and Mayans ‘Uru’, the “Great West Land”, was the “Land of Origin of all Mankind”, the land of their ancestors; a mighty culture-bearing white race that had once come among them, providing them with their ruling class and giving them their architecture. This is supported by the similarity between certain Uruan Serpent and eagle altars and pyramidal forms, as well as other early Uruan cultural features found within Australia, and those of the Amerindian cultures. Turning to South-east Asia and beyond, we find an increasing array of traditions, extending on across Europe to the British Isles. Just off Australia’s north-west coast lies Timor, where the name ‘Uru’ is found in ancient traditions which tell of a stone-building, god-like race of people who once arrived there from the “Great South Land of Uru”, and who journeyed on beyond the islands to the north. The Javanese referred to the early Indo-Aryans as the ‘Yavana’, meaning “Young Ones”, and believed that their ancestors arose in the “Great Land of Uru” to the south, to migrate through Java by sailing there from the east, and on up through island South-east Asia, to spread culture and civilisation across the earth. Similar traditions were entertained in ancient Ceylon [then called Lanka], and in India the name ‘Uru’ was widespread, as was ‘Meru’, both ancient Indo-Aryan names for the southern continent; “the motherland of the gods”. Their Supreme Being was Indra, and they believed that this concept originated with the original Aryans in the land of Uru. A variant of the word in Hindu is ‘Ur’, meaning “Fire’. Another variant for ‘Ur’ was the Sumerian ‘Kur’, meaning “mountain land” or “foreign land”, often in reference to Australia itself; and their Goddess of Heaven was called ‘Aruru’. Throughout ancient Mesopotamia the name ‘Uru’ was synonymous with the beginnings of humanity. Famed Norwegian explorer and anthropologist, the late Thor Heyerdahl, once observed that the name ‘Ur’ to the ancient Sumerians meant “people of Ur”, which he noted was similar to ‘Urukehu’ in Polynesian language, which means “descendants of the first chiefs”. As we will see later, the Sumerians were well aware of Australia’s existence, and besides calling it the Great Southern Land of Uru, variously also knew it as ‘Uluru’, meaning “People of Uru”, and also “Land of Uru”, and also ‘Auralia’, variously meaning “Land of the Aryans”, and the “Great South Land of gold”.